Pipe organs have played an important role in church music for centuries. With advances in technology, alternatives to pipe organs became available. This started with the electro-mechanical Hammond Organ and later analog oscillator technology pioneered by Allen Organ Company. Analog oscillator technology permitted affordable production of fine organs. However, their sounds did not accurately reproduce the grandeur of pipe organs. That began to change in 1971 with the introduction by Allen Organ Company of the first digitally sampled organ that made possible more precise reproduction of pipe sounds. Today, most electronic organs use digital sampling technology. As with pipe organs, not all digital organs are equal. With advances in digital technology, as well as the cost implications, most churches today choose a digital organ to support their music ministries. Some digital organs can even stand up to a direct side-by-side comparison with quality pipe organs. Below is a link to video of a two organ concert in Rijssen, The Netherlands, that included a small two-manual Allen digital organ and a fine pipe organ. The results are amazing, especially when considering that a pipe organ of this magnitude would cost at least 20 times more than the digital organ. Just imagine the results if it were compared to a digital organ of comparable size. Amazing,…I couldn’t tell which organ was playing,…the pipe instrument or the Allen digital organ! Digital organ technology,…especially Allen’s,…has come such a LONG LONG way! 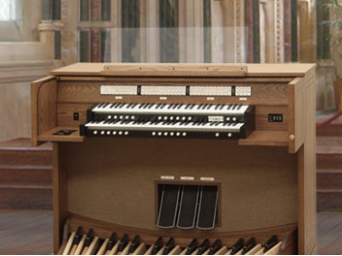 Is there really any other organ to go with when considering a digital organ? No way,…absolutely not,…Allen’s your only choice hands down! And when it comes to sound,quality,reliability,longevity,and long term customer support,..NOBODY beats Allen,…NOBODY! The difference between pipes and Allen was obvious. Allen is behind most other company’s when it comes to that. High end companies like Walker have a much more organ like sound. And for me Walker had been the only company to ever fool me. I couldn’t tell the difference between pipes and Walker. Biased comment that ignores the fact that the Allen was a small two-manual instrument up against a huge pipe organ. So you proclaim your ability to tell the difference between Allen voices and pipes in the same room. Are you willing to back this up with a test that even some of the best organists have failed? Give us your location and we will make it happen and allow you to “show your stuff”. I do work for an Allen dealer and I’m familiar with their sounds and where they lack tonally. We are planning in doing a hybrid Allen soon. I’m curious to see the results of that. But I would be happy to take the test. In fact I’d love to participate in the test with many others to observe the results. I’d also like to use other brands with more realistic sounds and see how the results compare. However before I want to reveal my location I’d like to say my views are mine alone and not a reflection of the dealer and his business. We await your name and contact information. I won’t post my contact info publicly but your site makes me leave an email address. Feel free to email me if you’re serious. I’d love a real blind test between Allen, Rodgers, Walker, Viscount and the finest Skinner in my city. Contact Allen’s VP of Sales for further assistance. Of course, Steve “Dewey Jacks” Markowitz doesn’t hear a difference. Everyone is on to you guys. This just makes your company look worse. Unless you are willing to take the side-by-side test, your real intent has been exposed. I’m wondering why Nathan is referring to me as Steve “Dewey Jacks” Markowitz. I highly doubt that is Steve’s middle name! I listened to the video,and I honestly could not tell if I was hearing the pipe voices,or the digital voices. Oh,..and Allen is NOT behind in their technology,…such claims are unfounded! As a classically trained organist for over 40 years I have played hundreds of organs both traditional pipe, pipe/hybrid and full digital, including the world-famous pipe organ located on Temple Square in Salt Lake City, Utah. I have access to three pipe organs and five digital organs in the Greater Vancouver, BC area as I adjudicate for the Royal Canadian College of Organists. The organ that I play for weekly church services is an Allen LD38A. It’s handdowns the finest digital organ I’ve ever played. Pipe organs require constant maintenance and tuning. Once an Allen is installed and tonal finishing is completed they are absolutely on-par with a similar pipe organ if not slightly better. I’ve played, Allen’s, Rodgers, Rolands, and pipe organs. Nothing compares to the Allen’s. Thank you for your kind words. And thank you for being transparent identifying the person behind the opinion. You’re so right,Cory! Nothing compares to Allen! If this “Organ=editor” has any affiliation ………. Your unsupported complaint has been blocked. The fact that you did not list any inaccurate item in this Blog brings to question the motivation behind your complaint. As much as the folks in Allen may want us to believe that it is difficult to tell which instrument is playing, it is clearly obvious. I don’t believe that anyone could be “fooled” by this clip. Every time the pipe organ plays the audience look up to the left!! Simples!! Seriously though… Even if you hate Allen and are biased towards another brand its difficult not to admit that the Allen actually sounds better in some places than this particular pipe organ. I would love to know which Allen model it is? A CF-10, one of Allen’s smallest 2-manual organs.